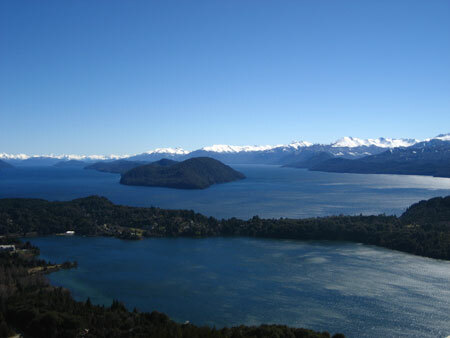 Some of the best views in Argentina are found from the beaches of Lake Nahuel Huapi surrounding Bariloche. The staggering views can be appreciated from nearly any part of town. One sight-seeing hot spot that can be found in the city is in the town’s civic center. Here you are bound to find others relaxing on a park bench or sitting in the grass pastures while soaking in the views. These picturesque mountain ranges may inspire you to see more, and El Circuito Chico (the Short Circuit) provides the perfect opportunity. Every thirty minutes you can jump on the bus that follows the water line toward the Chilean border. This beautiful 65 km route can easily be appreciated on the bus but an even better option for those of you who are outdoor enthusiasts is to take on the Circuito Chico by bike. Following the circuit in the clockwise direction is the easiest way. But regardless of which way you ride you are guaranteed to feel your heart pumping and be breathing deep. It is not a beginners bike ride but very feasible. 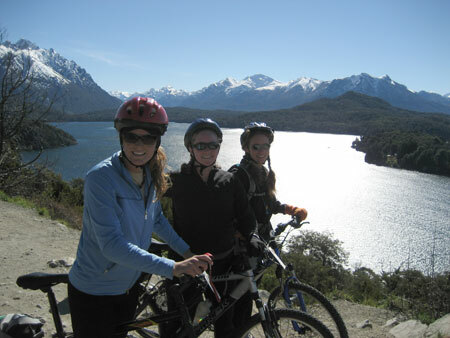 There are numerous shops in Bariloche where you can rent a bike, helmet and repair kit for the day for 30 pesos. They will also sit down and show you a map of the area and while warning you to be careful of the cars as well. The further into the bike ride you get, the clearer the traffic gets; but it is imperative to ride in a single file line at the beginning. Bike lanes have definitely not yet been established in Argentina. The first must-stop along the way is at kilometer 10 where you will approach Cerro Campanario. There is a chair lift that climbs to the top of one of the peaks and looks out over the whole lake region. It is one of the most fascinating views of the region and according to National Geographic also one of the top views of the world. There is a restaurant that sits at the top where you can stop for a snack or lunch; but if you don’t find yourself hungry the balconies that look out over the lakes and Andes Mountains are more than enough to keep you entertained. 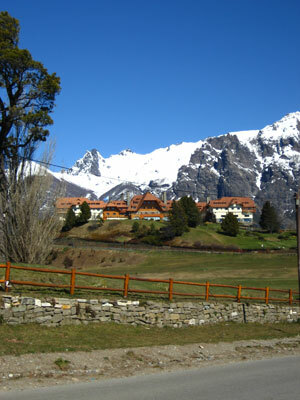 One of the next big stops along the ruta is Hotel Llao-Llao. The massive hotel sits right on a peninsula in the lake region. It is surrounded by an 18-hole golf course and is stocked full of amenities such as a spa and health club, fancy restaurants, a lobby bar, winter garden, a club house, boutique shops, and much more. Yet, the most impressive part of the hotel for me is not the hotel itself but its location. While I would have loved to wake up in the morning to those views, traveling on a budget makes it an obvious decision when choosing between these luxury accommodations or the pristine hostel life which runs at approximately ten U.S. dollars a night. Although I did make it a stop along my ride, parked my bike, and enjoyed browsing around inside in my biking spandex and helmet. On the backside of the 65 km ride the traffic clears up. There are fewer cars to challenge your ride but more hills and climbs. After shifting down to your lowest gear and pedaling as hard as you can up the hills you will be relieved to reach the top and maybe even take a quick breather. The local Argentines who have done this ride themselves must have realized this break necessity when they decided to take advantage of the opportunity. There are two or three stops along the way, all conveniently place at the top of these big hills. Small stands are set up where you can buy their goods and take it home as a memory. One of these stops is at a lookout that is my personal favorite. If the climb up the hill hasn’t already exhausted you, the view that sits at the top will surely take the rest of your breath away. 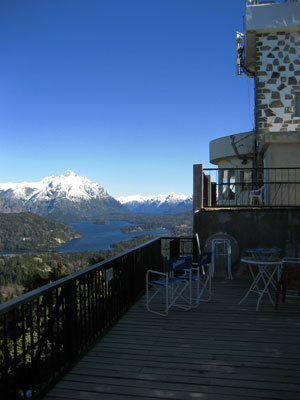 Directly in front of you will be the amazing panoramic view of the merging point of Lake Moreno and Lake Nahuel Huapi. The snow-capped mountains in the background frame the lakes and beautiful nature stretched out before them. From here it is smooth sailing back to town. 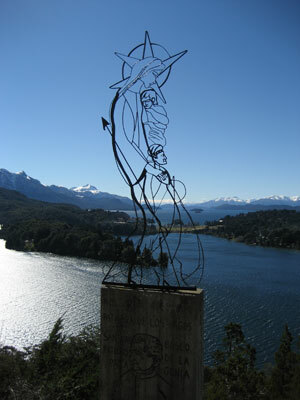 The road meets back up with the Ruta that was followed in the beginning and it is a familiar ride back to Bariloche. At the end of 65 km you are bound to be tired, and hungry. With stops included the total trip will most likely take anywhere from 4-7 hours. It is a great way to spend the day outdoors and get some exercise at the same time.